Just Say Yes Events: Luxury Bridal Expo Showcase Inspiration. Just Say Yes! Events is very excited to start the new year off with a bang! Our first Luxury showcase took place at the Renaissance Hotel & Convention Center in Schaumburg Il. 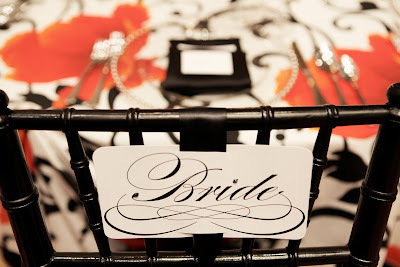 We love the entire team at Bridal Expo, they always do so much for us at Just Say Yes Events. Bill Brennan President of bridal Expo pulled out all the stops with this show, including a huge fashion show stage area with gorgeous lighting, Couture gowns by Leigh Price and lets not forget over 75 vendors!! The show was a big hit with a whopping 500 brides registered and their families and friends. Now we knew this show would be huge being that it is the beginning of wedding season. We went back and forth with ideas and inspirations for our reception showcase. We originally wanted to do and all black and white table with modern touches until I visited my favorite linen vendor BBj Linen in Skokie Il. I was there for a meeting with a bride and my sales representative Lanie Hartman...On a side note, Lanie is Amazing!! So I walk through the showroom and there is this linen that immediately catches my attention. 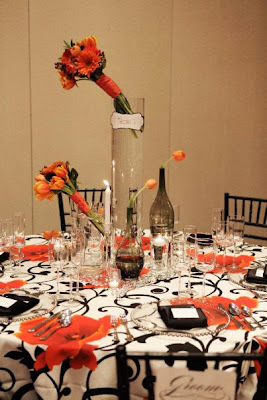 Its a ivory linen with black scrolls and huge orange florals. Once I saw the linen I thought "I have to have that!!" I ordered it for our showcase and then the wheels started turning I had to re-designed the entire showcase within 10 minutes. I immediately called our rental vendors, floral vendor and our graphic designer to re-design few things! I was able to re-design everything in the car on the drive back to the office!!! Here is what we came up with...Enjoy! 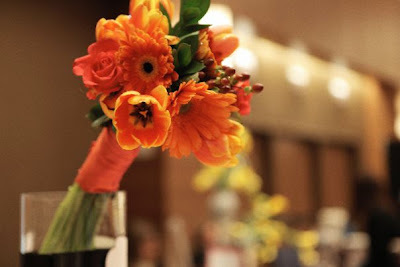 We chose orange floral for the centerpiece consisting of tulips, gerbera daisy, roses & berries. The bunches were tied with pieces of dupioni silk in a bright orange. We placed the bunches in the tall cylinder vases on an angle for interest. In this photo you can see the entire set up. We wanted to do something different with the centerpiece. This one has different shaped vases, floral heights etc. 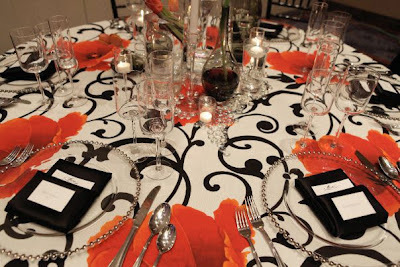 Its fun for guests as they are seated for dinner looking at all the different elements. For the place settings we went with glass silver beaded chargers, modern stemware, scroll detail flatware & black lamour napkin folded to hold the menu card and place card. We loved using lots of clear glass so that the candle light could reflect through all the vases, candle holder & Stemware. Now this was a HUGE hit with the brides. We received so many compliments on our "Bride & Groom" signs. We custom designed these for the show... It's another nice detail to make the bride and groom feel special! We loved how they turned out especially with the addition of the little crystals we attached to them....You cant really see them in the photo they were black colored crystals. 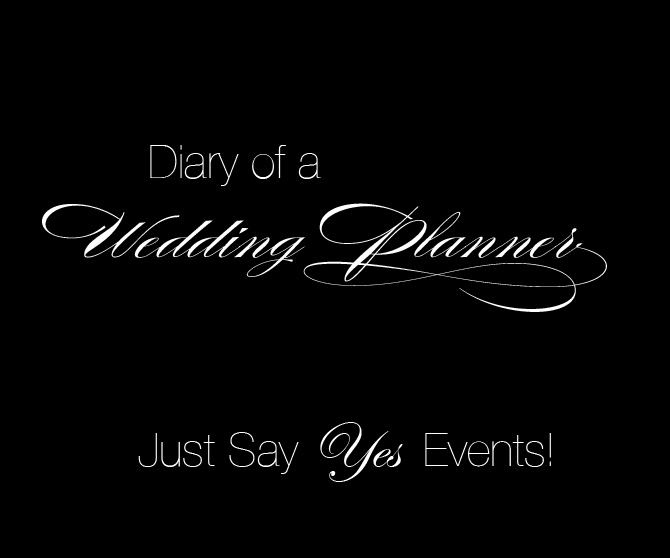 All photos C/O Just Say Yes Events!